Are you working odd hours, extra shifts and not able to spend quality time with family and friends? Are you burned out & feeling under-appreciated by your bosses, nurses, doctors and patients? Are you getting depressed with the outcome of many of your patients? Do you feel like there is a glass ceiling where you work and no room for advancement in your career? If you said yes to any of the above questions becoming a Medical Spa Front Desk Coordinator may just be for you. HIGHLIGHTS OF YOUR ACTIVITIES: As an Artisan’s Front Desk Coordinator you are the face of our company. All patients come and go through you. You have the opportunity for sales bonuses and will enjoy regular customer service interactions. You are the gateway to providing red-carpet service in aesthetics. You get to help guests understand the bene ts of taking care of their skin and body, setting them up on our loyalty and membership programs. You will maximize the positive impact by starting their journey with a scienti c skin-care analysis via our VISIA machine and educating them of our many state-of-the-art aesthetic, medical products and procedures, as well as learning to apply makeup to all skin types. You will also be in charge of making sure all guests continue their rejuvenation journey with Artisan’s. You are a critical part of helping people feel and look their best. 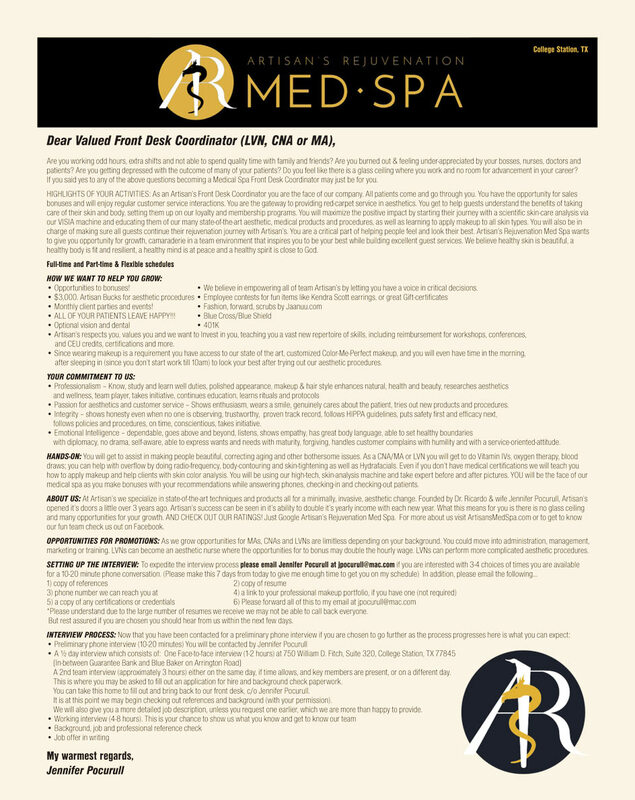 Artisan’s Rejuvenation Med Spa wants to give you opportunity for growth, camaraderie in a team environment that inspires you to be your best while building excellent guest services. We believe healthy skin is beautiful, a healthy body is t and resilient, a healthy mind is at peace and a healthy spirit is close to God. • Monthly client parties and events! • ALL OF YOUR PATIENTS LEAVE HAPPY!!! and CEU credits, certi cations and more. after sleeping in (since you don’t start work till 10am) to look your best after trying out our aesthetic procedures. follows policies and procedures, on time, conscientious, takes initiative. with diplomacy, no drama, self-aware, able to express wants and needs with maturity, forgiving, handles customer complains with humility and with a service-oriented-attitude. HANDS-ON: You will get to assist in making people beautiful, correcting aging and other bothersome issues. As a CNA/MA or LVN you will get to do Vitamin IVs, oxygen therapy, blood draws; you can help with over ow by doing radio-frequency, body-contouring and skin-tightening as well as Hydrafacials. Even if you don’t have medical certi cations we will teach you how to apply makeup and help clients with skin color analysis. You will be using our high-tech, skin-analysis machine and take expert before and after pictures. YOU will be the face of our medical spa as you make bonuses with your recommendations while answering phones, checking-in and checking-out patients. ABOUT US: At Artisan’s we specialize in state-of-the-art techniques and products all for a minimally, invasive, aesthetic change. Founded by Dr. Ricardo & wife Jennifer Pocurull, Artisan’s opened it’s doors a little over 3 years ago. Artisan’s success can be seen in it’s ability to double it’s yearly income with each new year. What this means for you is there is no glass ceiling and many opportunities for your growth. AND CHECK OUT OUR RATINGS! Just Google Artisan’s Rejuvenation Med Spa. For more about us visit ArtisansMedSpa.com or to get to know our fun team check us out on Facebook. OPPORTUNITIES FOR PROMOTIONS: As we grow opportunities for MAs, CNAs and LVNs are limitless depending on your background. You could move into administration, management, marketing or training. LVNs can become an aesthetic nurse where the opportunities for to bonus may double the hourly wage. LVNs can perform more complicated aesthetic procedures. *Please understand due to the large number of resumes we receive we may not be able to call back everyone. But rest assured if you are chosen you should hear from us within the next few days. A 2nd team interview (approximately 3 hours) either on the same day, if time allows, and key members are present, or on a different day. This is where you may be asked to ll out an application for hire and background check paperwork. You can take this home to ll out and bring back to our front desk, c/o Jennifer Pocurull. It is at this point we may begin checking out references and background (with your permission). We will also give you a more detailed job description, unless you request one earlier, which we are more than happy to provide.